Around March 25th, a caravan of about 1,175 people seeking asylum headed north towards Mexico and the United States, guided by the humanitarian aid organization, Pueblo Sin Fronteras. Most of the people in this caravan are Hondurans fleeing political violence, Salvadorans fleeing gang violence, and LGBTQ youth who fear persecution. 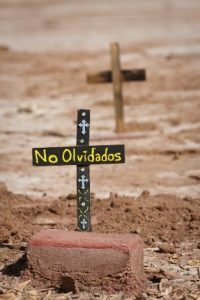 In Spanish, these caravans are called “Vía Crucis Migrantes” or “Migrants’ Way of the Cross.” The weight of the crosses they bear is on their backs as they make their way through Central America and Mexico. Walter Brueggemann writes in his book, The Prophetic Imagination, “Passion as the capacity and readiness to care, to suffer, to die, and to feel is the enemy of imperial reality. Imperial economics is designed to keep people satiated so that they do not notice. Its politics is intended to block out the cries of the denied ones. Its religion is to be an opiate so that no one discerns misery alive in the heart of God.” This is why the Passion of Jesus Christ is such a compelling narrative—Jesus chose to suffer in order to shake the foundations of imperial reality. 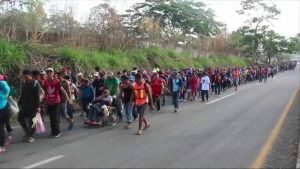 Image of the Caravan walking through Mexico from CNN. This is exactly what the caravan is doing. This year’s caravan is much larger than previous years’ groups and its size was the reason why Mexican border agents did not make much of an effort to stop them. This power, of people desperate for safety, drew the attention of the President, who threatened to deploy National Guard troops and called for tougher immigration policies. On May 1st, twenty-five of the 150 migrants who reached the US border were escorted to San Diego to begin the process of asylum. For those of us of the Christian tradition, this is where we are reminded again of the lessons of Easter; in the midst of violence and despair, there is the possibility of resurrection and hope. Twenty-five tombs are empty as these individuals begin the next part of their journey, with the hope of new life. Resurrection often does not mean a happy or satisfying ending. On the contrary, there is much waiting and the possibility of rejection ahead for the asylum seekers. For many, resurrection means that the story continues and that people have the prophetic imagination to dream despite their worlds being turned upside down. 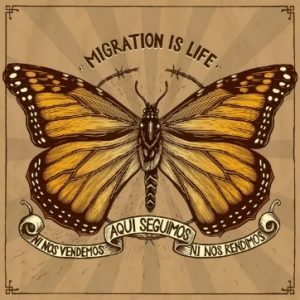 The symbol of migration is the monarch butterfly. The period of waiting is the time spent in the cocoon. It is the time of incubation and slow transformation into the dream of the butterfly, of freedom and transformed life. Change can often feel like a form of death, and experiencing these deaths is a way one can feel the true passion of being transformed and alive. If anything, resurrection is a call to action, and this is what Jesus did when he appeared before people after his death. Jesus called his disciple to act from a place of witnessing resurrection. Let this Caravan be our call to remember the transforming power of resurrection that often emerges from periods of uncertain waiting and the passion of suffering. Paige Foreman is interning at the Church Council of Greater Seattle as part of her service year with the Seattle Service Corps at Saint Mark’s Episcopal Cathedral. She has a Certificate in Spirituality and Social Change from Pacific School of Religion, where she studied the intersection of interfaith work, social justice activism, and the arts. This fall, she will start her Master of Divinity at Yale Divinity School.